In case you missed it, USA Today took a look at the New Orleans rental market, and found that families in unregulated rentals and neglected neighborhoods may face the greatest dangers from the Zika virus. Yet, leaving an unhealthy home isn’t always easy, especially for families that live paycheck to paycheck and can’t afford the costs of a move, such as new security deposits. The lack of healthy housing is getting local coverage, too, as renters face displacement in worsening conditions. 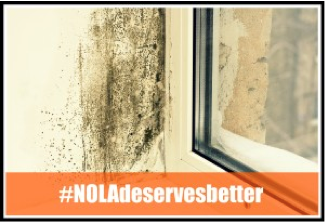 That’s why we need you to let City Council know you care about the damaging effects of substandard housing. Please take a moment to hear about the struggles that these parents face, then let our City leaders know you care.